Direct Commerce offers a sophisticated web-based platform that automates payment solutions for some of the world’s largest companies, many of which process millions of paper invoices per year. Turning paper-based systems into electronic delivery and management offers large companies such as Merck, Eli Lilly, Home Depot, and Bloomin’ Brands, among others, significant savings and more streamlined invoice processing operations. In addition, suppliers get their own secure web-based portals to check invoice and payment status, reducing phone calls to accounts payables departments. 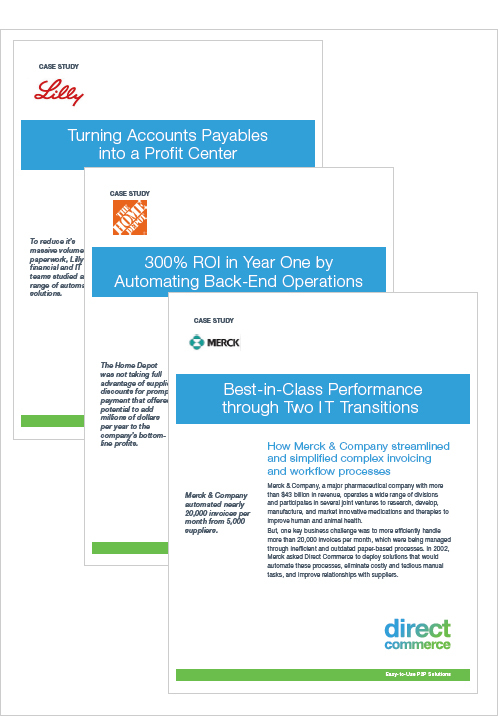 These case studies (PDFs) explain how specific Direct Commerce solutions have been deployed to meet highly specialized needs.